Blackjack has long been synonymous with casinos and gambling. While there are many variations of this classic online casino game, at their core, they are all the same. By adding up the values of their cards, punters must have more points than the dealer, without going over 21. You can go to any casino or online casino sites in the world and you’re sure to find a game of 21. 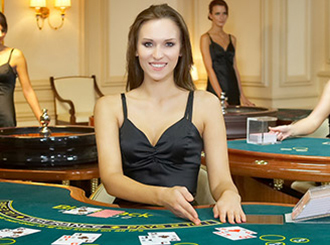 At MansionCasino.com we’ve managed to combine the convenience of online blackjack with the excitement of a real world atmosphere when you play Live Blackjack. You’ll need to open an account and make a deposit in order to gain access to the exclusive MansionCasino.com Live Dealer games. Once there, you can find a table in the Live Blackjack room and take a seat. Whether you choose to sit at an empty table, or play with friends is up to you. The Live Feed will start immediately and you’ll be able to interact and see the dealer as they go about shuffling and dealing the cards. You will see a running timer that lets you know how much time there is until the betting closes and the cards are dealt. If you don’t manage to get your bets in time, don’t worry you won’t get kicked out of the table, just patiently wait for the hand to end. The rules are the same as a traditional game of online blackjack. The dealer will have two cards, one face up and one face down and you’ll be dealt two cards face up. When your turn comes you can choose to hit, stay, double, or split (when applicable). The dealer will always hit up to 16 and stay on a 17, so keep that in mind when making your decision. A blackjack (Ace and a picture card) will pay out 2:1 and the player has the option to buy insurance when the dealer is showing an Ace. Open your account at MansionCasino.com today and start playing Live Blackjack for real money. Using any of our convenient payment methods, you can make a deposit and fund your account. Once the money has been processed you’ll receive a Welcome Bonus up to $/€5,000 and you can start playing for real money right away.